McKellen gets star on Wigan walk of fame Jump to media player Actor Sir Ian McKellen spoke to the BBC about being honoured with a star on Wigan's own walk of fame. Gandalf gives exam advice Jump to media player Sir Ian McKellen who plays Gandalf in the Lord of the Rings movies gives exam advice to kids. McKellen on hobbits, Holmes and blogging Jump to media player The Hobbit: The Battle of the five Armies is the final film and as it hits cinema screens, Sir Ian McKellen has been reflecting on the impact that the movies have had. 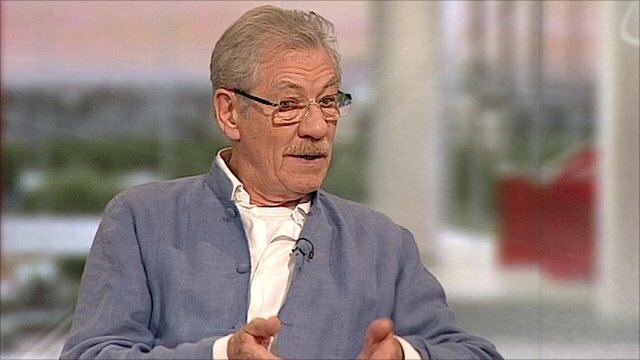 Ian McKellen joins the mafia Jump to media player Ian McKellen talks to BBC Breakfast about his latest role playing a mafia leader. 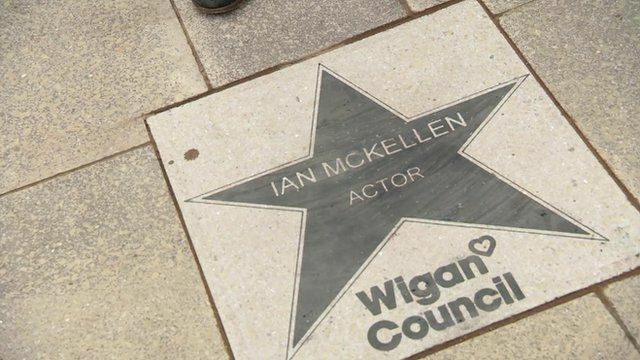 Sir Ian McKellen, the actor best known for his roles in the Hobbit and X-men, has been given a star on Wigan's own version of Hollywood's walk of fame. The 76-year-old lived in the town back in the 1940s. It was there he acted for the first time, and it was there he saw his first ever Shakespeare play. He spoke to the BBC's Colin Paterson.